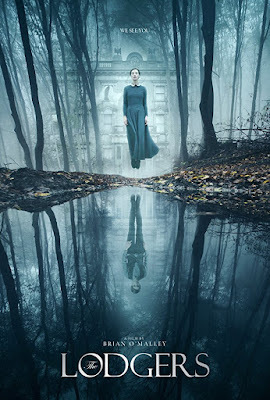 Today marks the release of the collector’s edition Blu-Ray/DVD combo pack for the supernatural thriller The Lodgers from Epic Pictures’ horror label, Dread Central Presents. Loaded with special features, the Blu-ray/DVD combo pack includes several languages Castilian Spanish, French, German and Portuguese as well as subtitles in Latin American Spanish, French, German, Portuguese, Danish, Finnish, Norwegian, Swedish, Dutch and Romanian. It was written by David Turpin, directed by Brian O’Malley, and stars Charlotte Vega, Bill Millner, David Bradley (The Strain), Eugene Simon (Game of Thrones), and Moe Dunford. You can read our review here. The Blu-Ray/DVD combo is available now at a suggested retail price of $19.99. Pre-orders are available exclusively through the Epic Pictures’ store at $14.99 here (Pre-order price will expire by the end of today). It is also available on Video-on-Demand platforms for a rental price of $4.99. For a list of where to watch go here. "Set in rural Ireland in 1920, this Gothic chiller evokes the spooky stories of Shirley Jackson and Oscar Wilde in its tale of teenage twins living in a haunted manor under the shadow of a family curse. A gothic ghost story about orphaned twins Edward and Rachel who share a crumbling manor in 1920’s rural Ireland. But they are not alone. They share the house with unseen entities who control them with three absolute rules. As separate fates draw them apart, the twins must face the terrible truth about their family’s ghostly tormentors."